The latest Sally Hansen I Heart Nail Art theme is TEXTURE! I got my hands on their new Fuzzy Coat line and knew that I had to do something adorable and fuzzy with them for my tutorial this month. 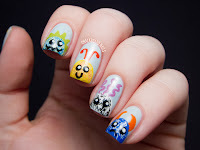 Read on to learn how to make these cute fuzzy monster buddies on your nails. Between body color, fur color, horns/hair/antennae, and expression, you can customize these little guys however you want! This design is perfect for bringing a little bit of whimsy into your life. Have fun with it! I used a bunch of Sally Hansen polishes for these looks, but the really important part is the presence of the Fuzzy Coats. These polishes are made up of tiny matte bar glitters, and come in a clear base so you can layer them over any color. They give the monsters their adorable, cuddly fur! The Fuzzy Coats in this photo are Fuzz-Sea, Tight Knit, Peach Fuzz, Tweedy, and Fuzzy Fantasy. I made this video tutorial showing you how to make the monster on my middle finger. Like I said earlier, these guys are highly customizable, so you can take this basic style and change it up with each nail. Here's a photo tutorial for the monster buddy on my pointer! Using the polish brush, paint a vaguely circular shape at the tip of your nail. I used Water Color over Breezy Blue. Add 1-2 coats of a Fuzzy Coat polish for the monster fur. This little guy is wearing Fuzzy Fantasy. Using a small nail art brush or toothpick, add on horns/hair/antennae. I gave this guy some rock and roll spikes in Lickety-Split Lime. Add two large black dots with Black Out where you want the eyes to go. Grab White On and add two smaller dots within the black dots. Try to position them in the same spot so they match! Add a monster mouth with your nail art brush or toothpick. You can make it crazy, sweet, frowny, whatever you like! Finish with topcoat to protect your art. Once again, I encourage you guy to enter your textured nail looks into the I Heart Nail Art competition. Texture is all the rage and we want to see how creative you can get! For the morning with Santa 's $50 for uncle and aunts and $34 for little ones age 2-12. These are so cute! I'm gonna have to try something like this myself soon! Oh my gosh! So cute and floofy! Seriously, this is the cutest way to use fuzzy coat! Love it!! 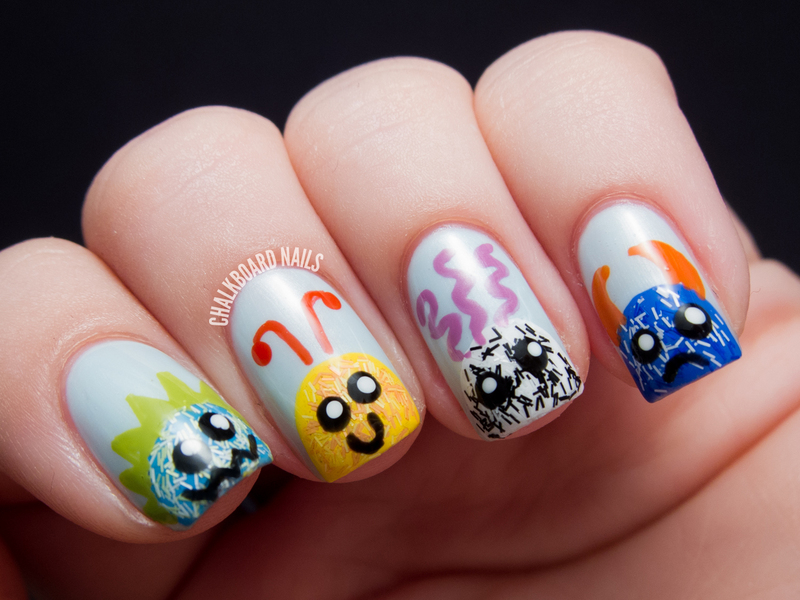 I wish I had a job where fuzzy monster manis made sense on a day-to-day basis. Love them! Awww these are super cute! What a creative way to use the fuzzy polish. Might have to grab a bottle of that, it looks cool! LOL oh my gosh, this is freaking adorkable! This is seriously adorable, I need to try it! Murphy store, which eventual became the Lincoln County Courthouse. Chocolate features a nasty tradition of melting near warmer weather. Well these are simply adorable. I love them! pure genius. seriously. i can borrow a lock of your hair or something? LOL - So love that comment! They are pushing it a little, even at my job (which is pretty relaxed!). Would be great for the weekend though! I have a lab that specializes in cloning awesome, you can forward it to them for me! lol! There may be more associated with sense of isolation and noise seclusion in a Ottawa two-story home. If you now don't learn how to be use the potty, then you can't go to toddler next month. MMA training kids keeps them personally active for lengthy. much old just much like the nation's history. So cute and funny! Love it! Only that he's doing the opposite of getting people fit. Watch a few music videos from 80s pop mavens on You - Tube to get inspiration for your outfit. You can go for a more costume like look by thinking of the original Material Girl and donning large, sparkly rhinestone or cubic zirconia pieces. 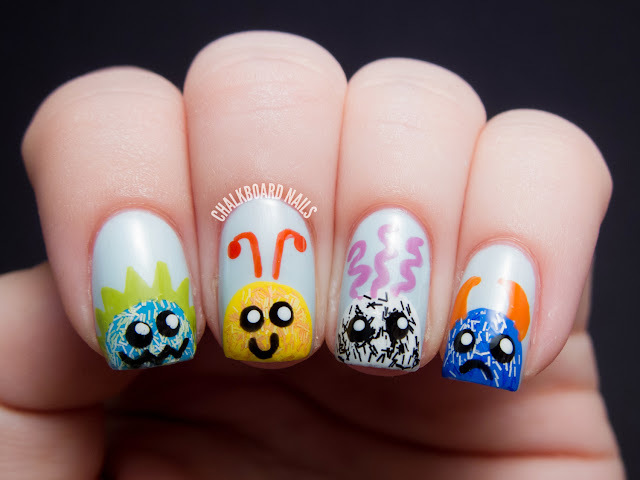 I'm loving these little cuties and the yellow one reminds me of the classic kid's game Cooties! Method disagree that a dog can not just enjoy a the hour training practice session. Split your sessions into a range of times of an day. Love these, so cute! 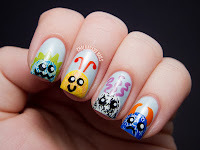 I would wear little monsters on my nails if I could do the art well enough. I am not very good at it as I don't have steady hands. music festival, stranded at the airport, or camping in the great outdoors. The rough places will be made plain, and the crooked places will be made straight.